Provide comfort for the family of Louise Cox with a meaningful gesture of sympathy. Louise Wilson Cox, age 95 of Granite Falls, passed away on April 9, 2019 at The Shaire Center in Lenoir, NC. 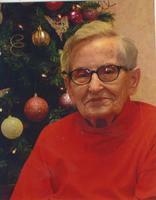 Mrs. Cox was born September 17, 1923 in Caldwell County. She was the daughter of the late Dewey Wilson and Lillie Mae Kirby Wilson. Louise was a member of First Baptist Church of Granite Falls. She spent her career as a nurse and in her free time, loved gardening and was especially proud of her participation in the Manhattan Project during WWII. In addition to her parents, she is preceded in death by her loving husband of 56 years, Eugene Cox, two sons; Anthony Eugene Cox and Douglas Eugene Cox; daughter, Judy Anne Cox Shaw; sister, Ruby Warlick and brothers, Carl and Darrell Wilson. Those left to cherish her memory are a granddaughter, Virgina Shaw of Hickory, sister Mickey Calloway (Owen) of Granite Falls; brother-in-law, Farel Warlick of Lenoir; sister-in-law Christine Wilson and numerous precious nieces, nephews and friends. The visitation will take place on Friday, April 12, 2019 from 3:00-4:00 pm at First Baptist Church Granite Falls with the service to follow at 4:00 pm. Burial will be in Pinecrest Cemetery, Granite Falls. Pallbearers are Eddie Wilson, Teddy Wilson, Dennis Wilson, David Powell, David Calloway, Ronnie Taylor and Richard Aultman. 902 Kirkwood St. NW, Lenoir, NC 28645 or First Baptist Church Granite Falls, 12 Crestview St., Granite Falls, NC 28630. Matt, Natalie, and Madelyn sent flowers to the family of Louise Wilson Cox. "Louise Cox" will remain in our hearts forever. Matt, Natalie, and Madelyn purchased flowers for the family of Louise Cox.